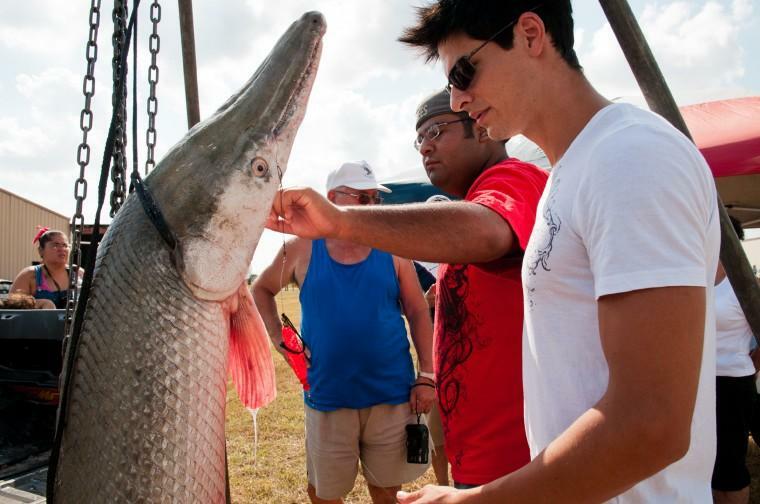 HARLINGEN — From trash fish to trophy, the homely alligator gar has come far in a short time. The apex predator in most resacas and rivers in the Rio Grande Valley once was reviled, or at best dismissed, by most anglers as unworthy of targeting. The prehistoric giants can grow to eight feet and nearly 300 pounds in Texas, with the state and world record alligator gar, or catan in Spanish, caught in the Rio Grande in 1951 by Bill Valverde. The trophy fish weighed 279 pounds. But the alligator gar’s rising popularity among anglers who are now specifically targeting the species with heavier tackle is raising concerns about whether the numbers of large alligator gar can be sustained. Until 2009, an angler could take as many alligator gar in Texas with rod-and-reel or by bow as they wanted. That’s when the Texas Parks and Wildlife Department issued its first bag limit of one alligator gar per day per fisherman. Just nine years later, state fisheries officials are concerned the new enthusiasm anglers are showing the catan could be leading to overfishing of the species due to its slow reproductive rate. Given how long it takes an adult gar to mature to spawning age — they can live to 60 years — waiting for the proper kind of flood could take years given how most Texas rivers are to some degree flood-controlled. Terre and others are concerned too many large alligator gar are being taken by fishermen and those big fish will take years or even decades to replace. Outside of the occasional large alligator, the gar are the apex predators in the watery ecosystems they inhabit, and are important to keeping things balanced. Concerns about replacing what could be a 60-year-old fish, or at least to obtain a better handle on who is catching what within the fishery, TPWD has proposed changes in regulations which cover fishing for alligator gar. On the Trinity River, a world-renowned alligator gar fishery, potential changes include instituting a four-foot maximum length limit, meaning anglers could not harvest any alligator gar over that length, from the I-30 bridge in Dallas to the I-10 bridge in Chambers County. There would be no change to the one-fish-per-day bag limit. Bow-fishing for gar there and elsewhere in Texas also would remain legal but anglers would have to abide by the new rules. Other potential changes, however, could impact Rio Grande Valley anglers. TPWD fisheries managers would like to see a statewide requirement that anglers taking alligator gar report their harvest within 24 hours online or via a mobile app. Anglers would be required to submit the date, general location, size and method of harvest. TPWD biologists have studied alligator gar in some of the fish’s prime habitats such as the Trinity River watershed, Choke Canyon Reservoir and the Brazos River. Terre said some of the studies at Choke Canyon and on the Brazos and Trinity indicate a harvest rate of between 2 and 4 percent is occurring annually now, which is creeping toward that boundary of sustainability. In recent years there have been only two flood events on the Trinity River which have allowed alligator gar to spawn — in 2007 and again in 2015. “Those two year-classes need to carry us until the next flood for generations of anglers to come,” Terre said. While fried catan is a delicacy for many Rio Grande Valley anglers, others are concerned enough to begin catch-and-release for the big alligator gar they land. Terre said TPWD is not advocating regulations for only no-kill gar fishing. He believes there is room within the various Texas fisheries for both catch-and-release and table fare, whether it is gar, large-mouthed bass or catfish. “We’re seeing some guides, like you’re seeing some guides (in the Valley), change from bow fishing to rod-and-reel fishing or offering fishing both ways,” Terre said. “But we’re seeing more of a catch-and-release ethic for alligator gar going forward. “I think there is a cultural shift really, and people are starting to appreciate these fish more and starting to value them more and catching and releasing them more,” he said.